The data was added on ,	1 September 2018 read 204 times. The pro-militant White Helmets have changed their planned scene for an imminent false-flag chemical attack in Idlib province, media reports informed on Friday. 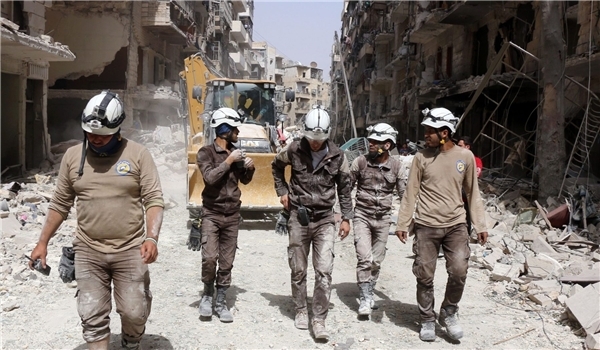 The Arabic-language al-Mayadeen news channel quoted informed sources as saying on Friday that 64 members of White Helmets, including 11 women, have been moves from Jisr al-Shughour to Idlib city. According to the report, the White Helmets changed their plan for staging false-flag chemical attack in Jisr al-Shughour after al-Mayadeen disclosed their plot. The new place for the false-flag operations will be Idlib city or Ma’arat al-No’eman, al-Mayadeen reported. A Russian media outlet said on Wednesday that a large cargo of poisonous materials, smuggled by the pro-militant White Helmets into Syria, had been transferred to a warehouse of Ahrar al-Sham terrorists in Idlib province for a false-flag chemical attack. The Arabic-language website of Sputnik quoted Head of Russian Reconciliation Center for Syria Alexi Siganokov as reporting that a number of the White Helmets Organization members had transferred a large cargo of poisonous materials to a warehouse in the town of Saraqib that is under Ahrar al-Sham’s control. It further said that the consignment was transferred on two large trucks from the village of Afas to Saraqib. Siganokov told the Arabic Sputnik that a part of the consignment was transferred to Southern Idlib in plastic barrels, adding the barrels of poisons will be used by terrorists to stage a fake chemical attack against civilians to further accuse the gov’t forces of the gas assault. Earlier this week, al-Mayadeen had quoted well-informed sources as disclosing that more than 250 members of the pro-militants White Helmets were preparing to take part in a fake rescue operation after a false-flag chemical attack by terrorists in Idlib province. It went on to say that the White Helmets transferred poisonous materials from Turkey to Syria via al-Hassani’yeh passageway, storing a portion of the materials in the village of Halouz near Jisr al-Shughour in Western Idlib. Al-Mayadeen further said that vast presence of the White Helmets aid workers were detected in Jisr al-Shughour prison, where poisonous materials have been stored. The TV further quoted the sources as disclosing that the terrorists were to stage a false-flag chemical attack in Idlib a week after the army’s upcoming operation in the region.